Photo by finchlake2000, used under Creative Commons licensing. Originally published by Village News, a publication of the community of Cabin John, MD. The banks of the Potomac can be a peaceful setting for a picnic on a warm spring evening. As my wife and I were taking in the view of the river from one of the sandy Potomac beaches below Lock 8, something caught my eye. A large headed object was breaking the surface of the river and headed straight towards us. It wasn’t until the creature crawled onto the bank that I identified our visitor from the Virginia shore—a beaver. The beaver shook the water off its dense coat and walked closer. It turned sideways so we could make out its distinguishing feature, a broad flat tail that is used as both a powerful oar and rudder and a way to communicate danger by slapping it on the surface of the water before diving below. A good-sized beaver can reach 55 pounds, making it the largest rodent second only to the massive capybara of South America, another river-dweller. This was a big fellow, or maybe a female, for unlike in most of the other 5,200 mammalian species, beaver females are often larger than males. We remained motionless while the beaver approached our blanket. It came within a few feet and then stopped and headed off into the riverbank forest, ready for another evening of work. 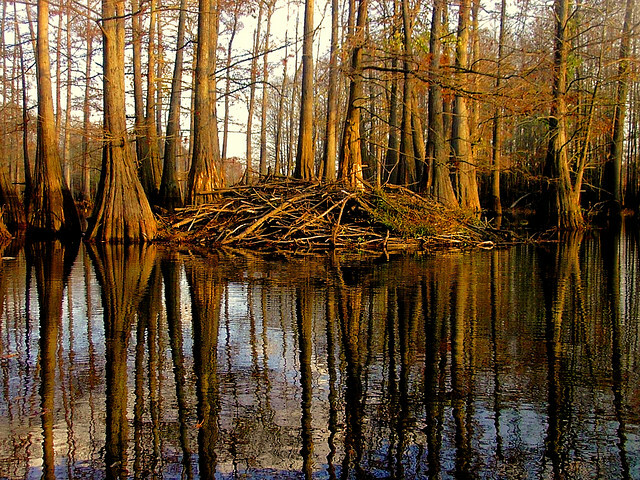 A beaver lodge in northeast Louisiana. Photo by finchlake2000, used under Creative Commons licensing. Beavers are nocturnal, like most mammals. But it is in the bright light of day, when they are safely asleep in their lodges, that we see the extent of their creation, or destruction, depending on your perspective. Along the trail bordering upper Cabin John Creek between River Road and Bradley Boulevard, for example, fresh signs of beaver are hard to miss. Here, groups of trees have been reduced to the tell-tale pointed stumps that can turn the riverbank into an otherworldly landscape. Beavers take down trees and stems to construct dams and lodges. The purpose of the dam is to flood an area around a lodge—like a wide, deep moat—and make it difficult for its predators to reach them. In the safest spot they build their lodge with sticks and mud that becomes a shelter—impregnable from above and only accessible through an underwater entrance. The large interior is highly functional: there is one platform where a wet beaver can shake off the water from its coat, and another perch where the now dry beaver clan can cuddle and sleep. The inside of the lodge has attracted the attention of architects, but it is the landscape architecture surrounding the lodge that garners the interest of ecologists. Simply put, next to humans, the North American beaver is the most influential landscape engineer north of Mexico. Through its networks of dams, beavers change water levels, create swamps and breeding areas for local fish and the fish predators that hunt them, draw in other species like muskrats, and mink, otter and fisher. And they don’t take Sundays off. Beavers are relentless builders and handymen; if their lodges or dams are damaged one night, they will be back repairing them the next night. In fact, the influence of beavers on the habitats of so many other species—from fish to frogs to aquatic plants, nesting birds and other mammals, some of which are listed as endangered species—is so pervasive that ecologists consider this landscape engineer a “keystone species.” A keystone species is one whose effect on the ecosystem is disproportionate to its actual abundance and whose removal would lead to dramatic changes in the local surroundings. Beavers also help maintain water quality and availability. The wetland networks they create through damming soak up floodwaters, and release water more slowly in times of drought. Beaver infrastructure also reduces erosion, raises the water table, and even purifies water. The silt collected above old dams sequesters toxic pesticides and other harmful compounds where they can be broken down by microbes. Beavers have also played a central role in U.S. history. Some authors argue that the settlement of North America was driven in large part by pursuit of beaver fur. In Cabin John as in Canada and much of the lower 48, beavers were virtually wiped out by the early 1900s by pelt hunters. The European Beaver, a different species, was completely extirpated over most of its range. 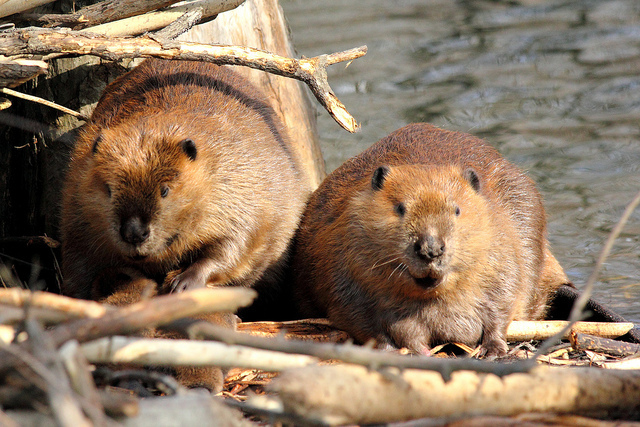 Thankfully, extensive recovery efforts and protection from over-exploitation has led to a recovery here in the U.S., although beaver still have reclaimed only about 10% of their historic range. Looking over the markings left by a working beaver, it’s a marvel that their teeth don’t wear down quickly and result in a short life and a mouth full of splinters. Just the opposite is true. Beaver can live to be 25 years old and their chisel sharp incisor teeth never stop growing. Rather than being rooted like our teeth, they are rootless. Beaver love to eat water lilies and fruit, but their meat and potatoes is the soft green tissues of trees. The shores of the Potomac have been shaped by beavers for eons but for a short period of several hundred years when we drove them to local extinction. Now they have regained lost territory. The same cannot be said for their extinct distant relatives, the Giant Beaver of North America, which may have roamed Cabin John until about 10,000 years ago. Biologists assume they disappeared before early hunters arrived. The giant version probably wouldn’t have lasted long anyway, standing seven feet tall and weighing close to 300 pounds; its fur and meat would have made it a desirable target. I still would have liked to have seen one cross the Potomac.